1) Click 'First Time Login' at the top of POEMS web page. POEMS 'Registration For First Time Login' page as shown in Figure 1 would be displayed. 2) Please take few minutes to read through POEMS' Terms and Conditions of Use, then click 'Accept'. 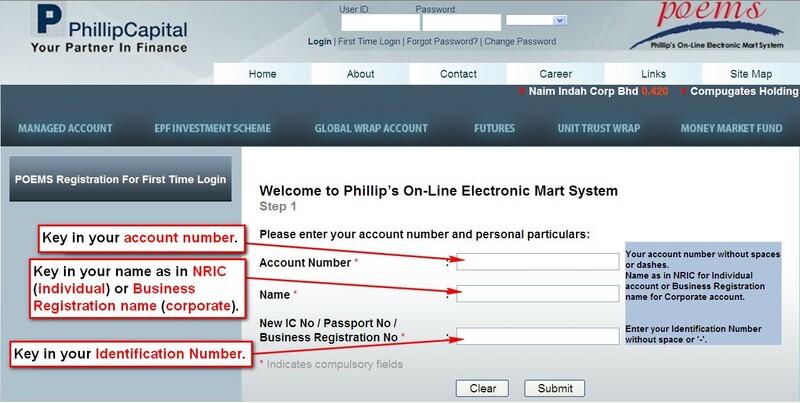 3)	Step 1 for 'Registration For First Time Login' as shown in Figure 3 would be displayed. iii)	New IC No / Passport No / Business Registration No. 5)	Click 'Submit'. Step 2 as shown in Figure 4 would be displayed. 6)	Enter preferred User ID (alphanumeric ID between 7 to 15 characters long) and click the link 'Check availability' to check whether the preferred User ID is available. If preferred User ID is not available, please try another User ID and repeat the check availability process. Figure 5: Prompt that confirm User ID is available. 7)	If preferred User ID is available, a prompt as in Figure 5 would be displayed. Click 'OK'. 8)	Enter password in the Password and Confirm Password field. Figure 6: Prompt that Security Code request is successful. 9)	Click the link 'Please click here to request for Security Code'. 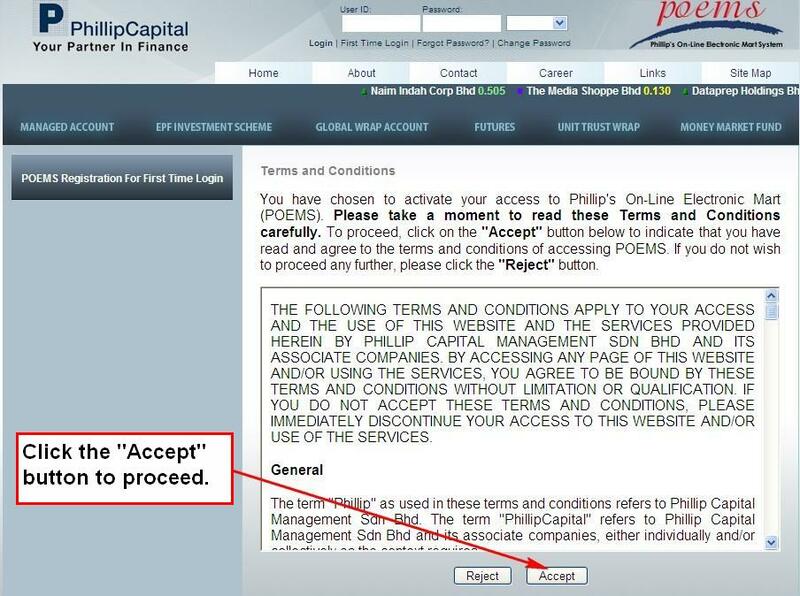 The following prompt as shown in Figure 6 would be displayed and Security Code would be sent to investor’s mobile phone via SMS within a few minutes. 10)	Enter the Security Code as stated in the SMS. Refer sample SMS in Figure 7. Security Code sent via SMS would be valid for 30 minutes. 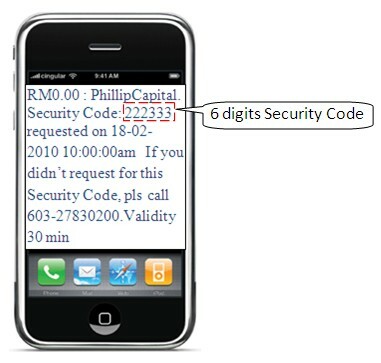 Figure 7: Sample Security Code sent via SMS. 11)	Click 'Submit'. Upon successful creation of User ID and password, a page as shown in Figure 8 would be displayed. Figure 8: User ID and Password successfully created. 12)	Enter newly created Login User ID and Password at the top of POEMS webpage then click 'Login' to login to POEMS. 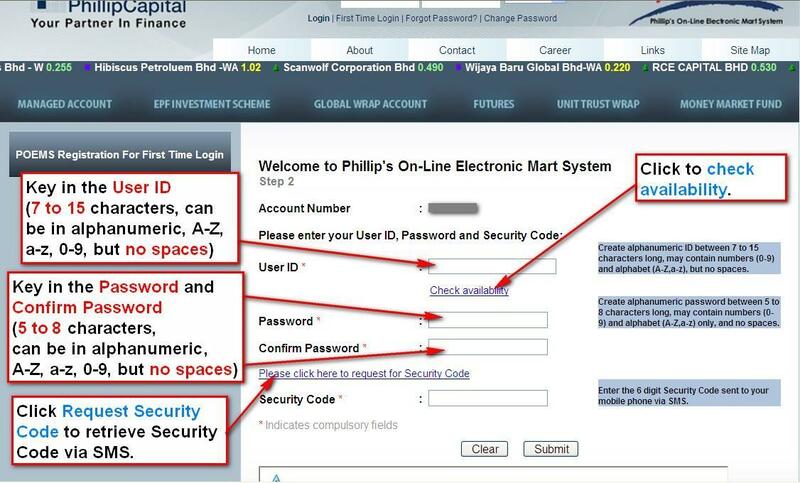 Note: For Corporate Account and Individual Account of which mobile number has not been registered with Phillip Capital Management, kindly do not use 'First Time Login'. Pin mailers containing Login ID and password would be sent to your mailing address by default. 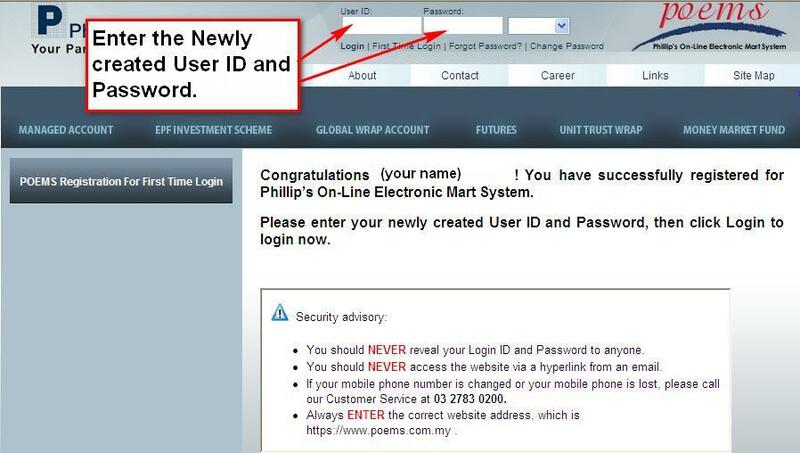 Upon receiving the pin mailers, you may enter the Login ID and password as stated in the pin mailers at the top of POEMS login page and click ‘Login’. Kindly call our Customer Service at 603-27830200 for assistance.